Telling you how I see things to be. Jennifer Chiaverini is the author of the Elm Creek Quilts series. She writes about quilts and the people who piece them. Her stories are more about people than about quilts, but once you read her books, you will gain an appreciation of quilts and why people piece them. The Union Quilters is a story of the women left behind as their men go to war. In the time of the Civil War (or The War Between the States if you prefer) the men go to do their patriotic duty and the women are left behind to cope. From the wife packing for her husband to go to war to women vigorously doing their part, this book takes you into the very personal part of war - the people. The Union Quilters form to make quilts to warm their men. Later they manage to send funds to the cause, to build a hall in which to meet, to learn to speak up as women. These women do not sit at home and cry. They "do something" which in their case means everything within their abilities. They grow as women and change with their changing times. I'm not a fan of war stories, but these stories are so real, so personal in feeling, you'd think to find their names on plaques scattered around the battlefields. Jennifer Chiaverini has done a fine job of telling this story. I recommend it. 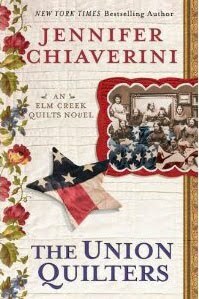 "The Union Quilters" will be available February 22, 2011. You can pre-order at copy from Amazon. You can find more about Jennifer Chiaverini and the Elm Creek Quilts series at http://elmcreek.net. This sounds like a neat book. Thanks for the review! I have read several in the elm creek series and am looking for a new read, sound like I should pick this one up! Thanks for stopping by, I love you're if I were... List! Have a great rest of the weekend! All you need to do is approach your world with curiosity.